The peace process has been allowed to drift into troubled water - what will happen next? NORTHERN Ireland Secretary of State Theresa Villiers was privy to two pieces of sensitive information on Monday April 28. The first was that she was privately told that police were about to question Gerry Adams over the 1972 IRA murder of Jean McConville. The second was that her office was about to announce the decision to refuse an inquiry into the 1971 killing of 11 civilians by British paratroopers in Ballymurphy, west Belfast. The fact that representatives of the British government learned of Gerry Adams’ fate on the Monday, yet proceeded to courier a rejection letter to the bereaved families of Ballymurphy on Tuesday morning, goes a long way to illustrating why the peace process is again facing crisis. Senior political sources are saying that failure to provide a mechanism to deal consistently with the legacy of the Troubles, not just by the British government but by others too, has left the political process at the mercy of events and left victims vulnerable to further trauma. It is a faultline that is now experiencing its most serious tremor. The decision of the Police Service of Northern Ireland to arrest Sinn Féin President Gerry Adams in connection with one of the most infamous killings of the Troubles was sparked by the allegations of former republicans, but it has led to an increasingly complex set of circumstances. Observers have noted that the human backdrop to the arrest could not be more disturbing – allegations over the kidnap, murder and secret burial of mother of ten Jean McConville, who was dragged from the arms of her terrified children by an IRA gang, before being killed and secretly buried. But while the focus so far has been on the McConville family’s disturbing personal tragedy, and Gerry Adams’ denial of any involvement, there will be wider political repercussions. If the crisis escalates, it will fall to Sinn Féin to make the next move and the party is clinging to inconsistencies over the handling of historic cases to justify its position. 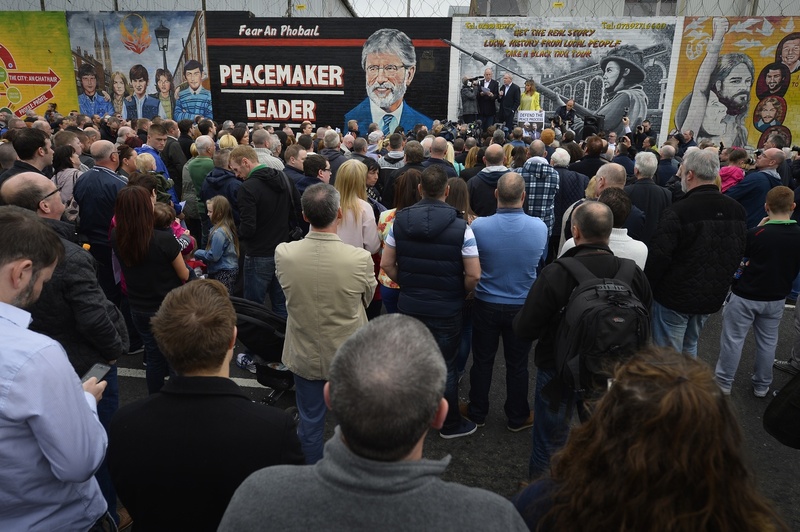 Gerry Adams has many detractors who cite his prominent role in the republican movement throughout the Troubles, but his party and its ever widening support base characterise him as the chief architect of the process that brought the conflict to an end. Sinn Féin is the unchallenged voice of nationalism in the north of Ireland, and recent polls placed him as the most popular political leader in the south, from where he has led his party since taking a seat in the Dáil in 2011. The party’s priority is to protect its potential for further political growth, particularly south of the Irish border. But it is unclear what options for protest it has that do not risk damaging that prime objective. Withdrawing support for policing, or the nuclear option of pulling down the Northern Ireland Assembly, risk undermining the political capital Sinn Féin has spent years building up. The party has recently proven adept at finding inventive means of exerting political pressure, such as blocking meetings of the Northern Ireland Executive at a time when republicans were angry at the failure of unionists to devolve policing and justice powers from Westminster. Sinn Féin has an experienced tier of leaders, with Martin McGuinness guiding the party north of the border, and Mary Lou McDonald central to its efforts in the south. But Gerry Adams is Sinn Féin’s biggest political asset at home and abroad, and if he was unable to remain as its fully functioning leader, it would have a massive ‘corporate’ impact on the party. Sinn Féin could face difficult choices as events develop and all its available options have significant consequences. The party claims to have made no decisions on its next steps over Gerry Adams’ case, but its hierarchy will have privately pored over every possible outcome and mapped out a sliding-scale of options. The final decision on Sinn Féin’s tactics in the days ahead and the future role of its leader is likely to fall to its chief strategist: Gerry Adams.